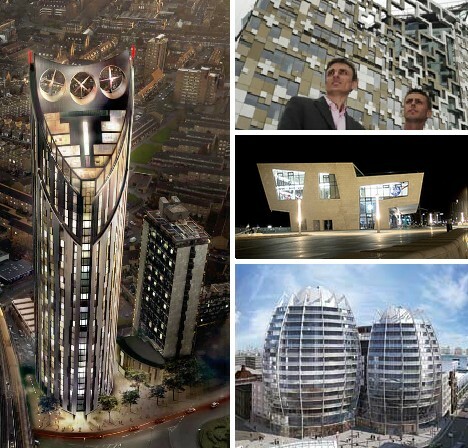 The Carbuncle Cup is an annual award bestowed by Building Design magazine upon the ugliest building in the UK over the past 12 months. 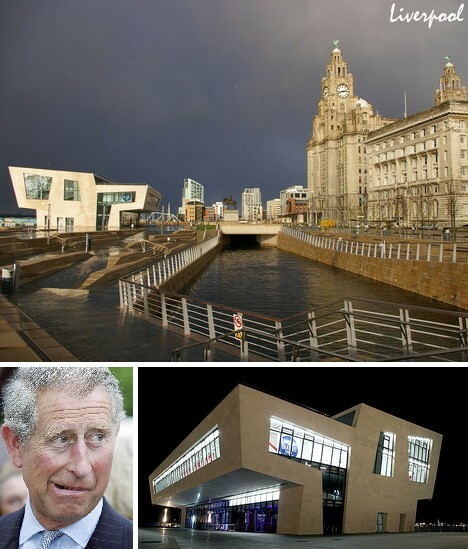 Since 2006 the dubious distinction of winning the Carbuncle Cup (named after Prince Charles’ infamous “carbuncle speech” given in 1984) has gone to five architectural abominations, each selected from publicized shortlists of 5 to 10 nominees. Here are the five “winners” plus five runners-up from the 2010 shortlist. 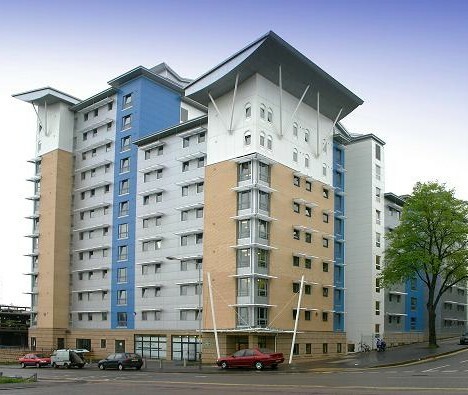 Opal Court in the city of Leicester, designed by Stephen George & Partners, is a housing block for students and key workers located near the city center. 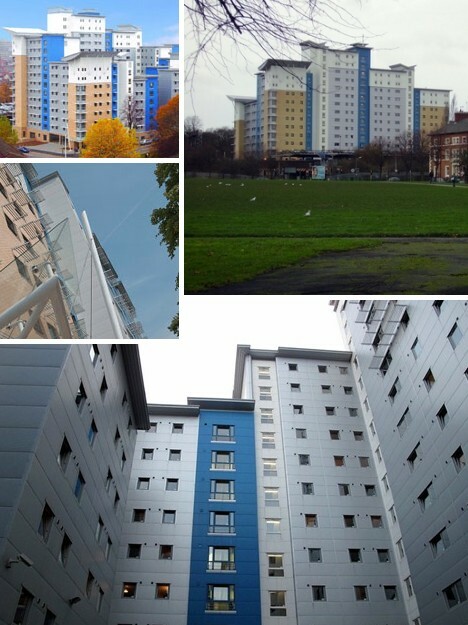 The anonymous nomination of Opal Court for the 2007 Carbuncle Cup was kinder than what might be expected, stating that Opal Court’s design is “symptomatic of the kind of rubbish being built in Leicester at the moment.” Misery loves company, one supposes. Critics on the jury who voted Opal Court this year’s winner more more specific (and more withering) in their criticism, stating “the tiny, token butterfly roof on the top of each core is pathetic, the colours are a grim, post-modern throwback, and in scale, language, materials, form and design, it’s a lesson in how to ignore context.” So, um, I guess they were less than impressed. 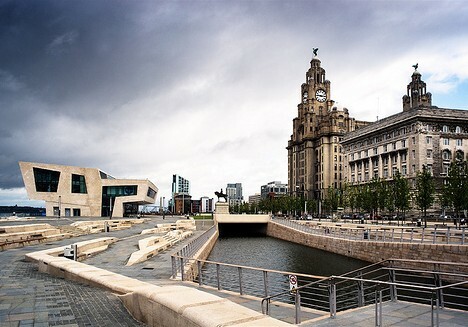 Often the man (or woman) in the street is unable to convey their impressions – good or bad – of new architecture in their city or town. 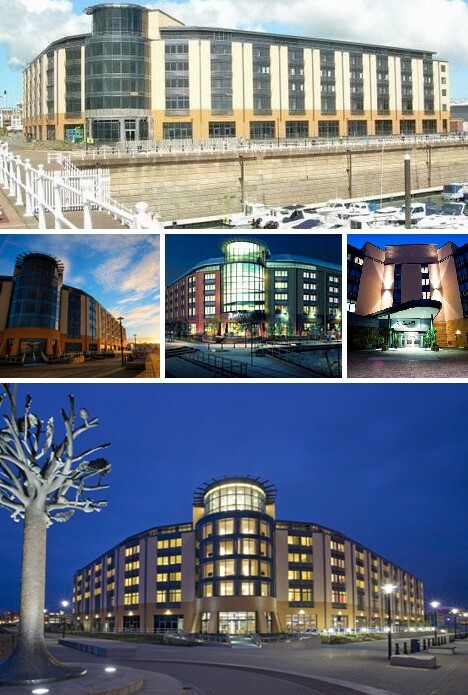 Not so the readers of the Jersey Evening Post, who peppered the editor with their near-universally negative opinions of the Radisson SAS Waterfront Hotel. Some of these include “like a communist-era east European sewage works” and “like the Chernobyl nuclear power station.” That’s hot. 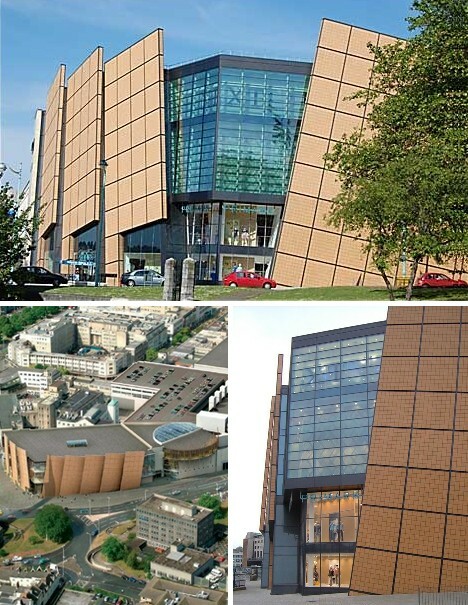 Describing EPR Architects’ somewhat controversial Radisson SAS Waterfront Hotel in his submission to the 2008 Carbuncle Cup jury, Alan Holmes was at a loss for words… just kidding, he described it as being “reminiscent of a cross between a blockhouse and a wheat silo.” Holmes WAS at a loss for images, however, stating “I fear my camera may not take the strain.” Luckily we have a few choice ones just above. According to detractors (of which there are many), the Bézier Apartments designed by TP Bennett and situated near London’s near Old Street aren’t just ugly, they’re “most offensively ugly.” Obviously being plain old capital-U Ugly isn’t enough to get one’s carefully thought-out project onto the short list for the 2010 Carbuncle Cup. 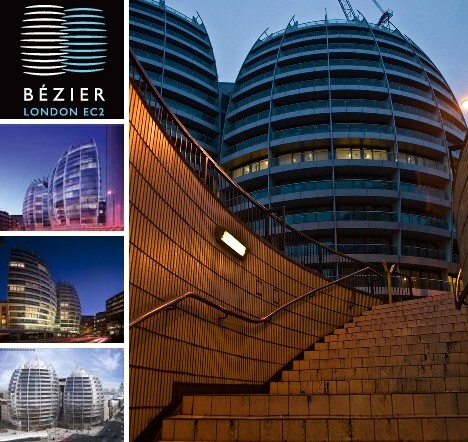 The Bézier Apartments consist of twin 14 and 16 story buildings containing a total of 200 apartment units. If their bulging facades aren’t enough to catch the eye, then how about the almost comically tiny windmills perched on their rooftops in the fashion of a quintessential beanie-wearing nerd. But back to the facades, which Building Design compared to a “gigantic pair of buttocks”… actually, with that there’s not much else to say. 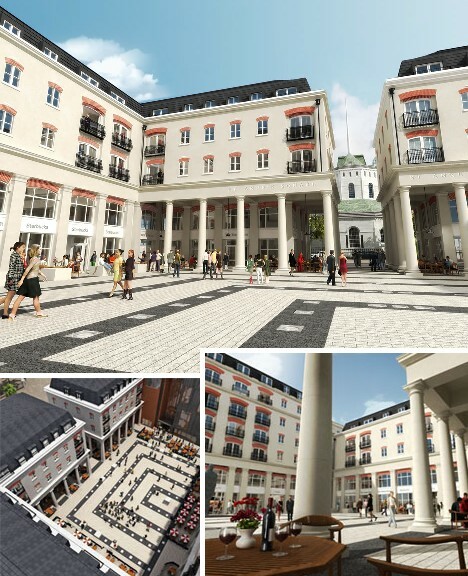 Saint Anne’s Square is a £100m leisure, commercial and residential development in Belfast’s Cathedral Quarter, said to be a major site of regeneration in the long-troubled Northern Ireland city. 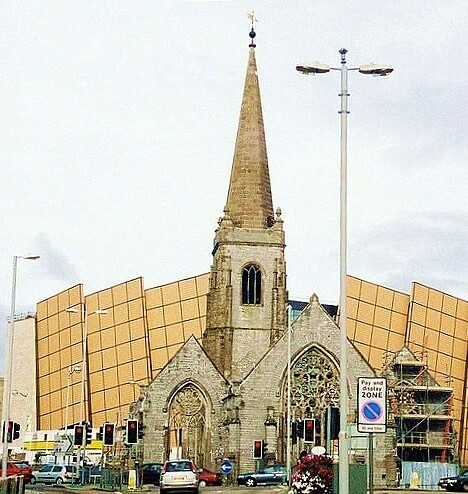 With that in mid, it’s nomination for the 2010 Carbuncle Cup has to be more than a little dismaying for proponents of Belfast city pride. 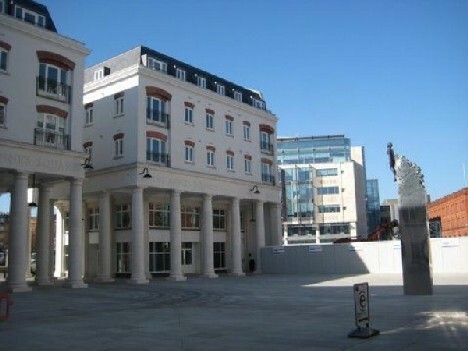 The design of Saint Anne’s Square (by WDR & RT Taggart) is described as “neo-classical pastiche mess” that is at the same time “overscaled and underimagined.” The area of Belfast in which Saint Anne’s Square is located was heavily bombed by the Luftwaffe in World War II – doubtless many critics wouldn’t mind inviting them back for another go. Haymarket Hub is the above-ground portion of the rebuilt Haymarket Metro station, which first opened in August of 1980 and displayed a rather plain, circular “roundhouse” look (above, top left). 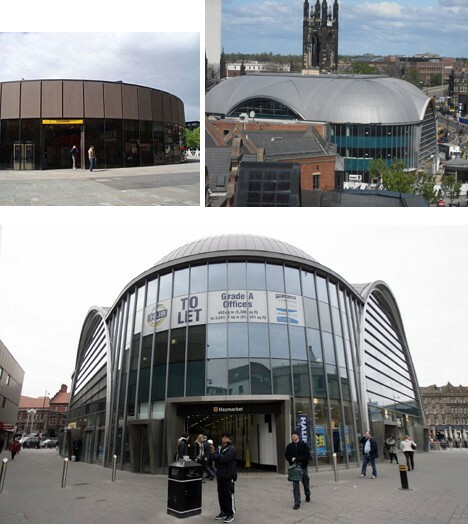 The station, on the Tyne and Wear Metro line located in the northern part of Newcastle’s historic city center, is used by about 6 million passengers annually. 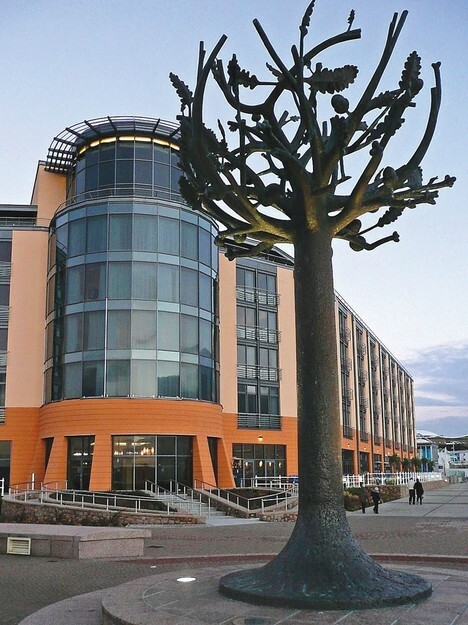 The upgraded Haymarket Hub building was officially opened March 29th, 2010 by Princess Anne. 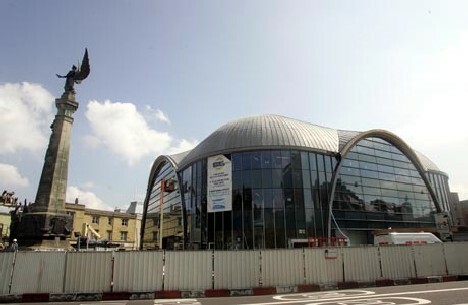 In early July the station was added to the shortlist for the 2010 Carbuncle Cup. The revised Haymarket Metro station completely rejects the modernist 1980 design aesthetic, instead opting for a 4-sided structure with glassed-in arches. 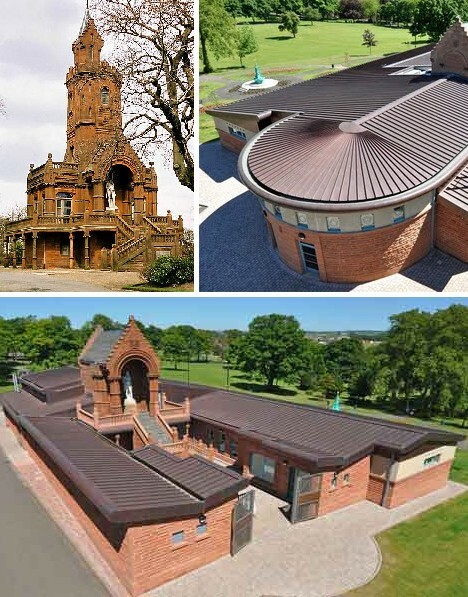 The Haymarket Hub was designed by architects Reid Jubb Brown (now Sadler Brown) and bears closer aesthetic kinship with romanesque Byzantine churches than anything existing today in Newcastle. 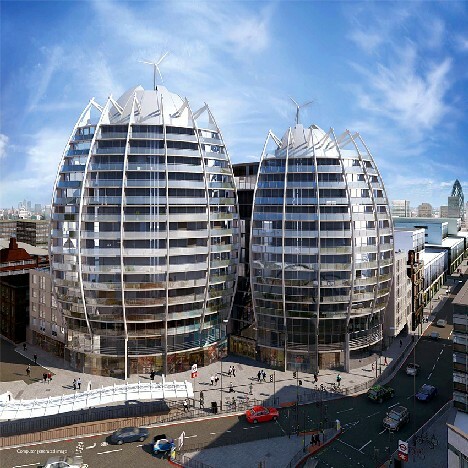 Being nominated for the Carbuncle Cup hasn’t fazed its architects, however, “because no architect wants his work to be so dull it goes unnoticed” according to Sadler Brown director Kevin Brown. 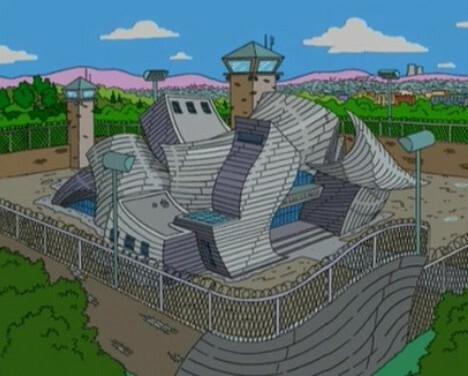 “Iconic buildings like the Eiffel Tower were considered eyesores when built but have become icons of our age,” added Brown in defending the structure. 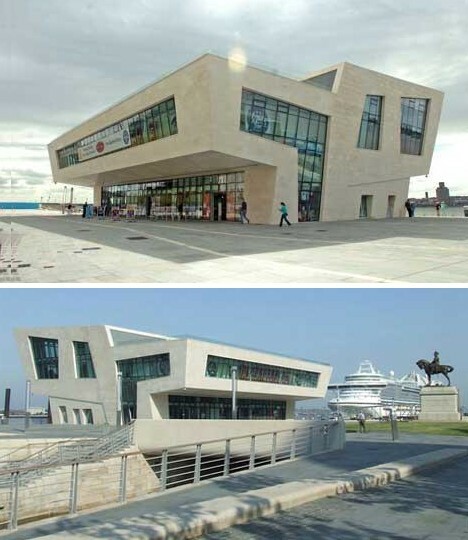 “The Haymarket Hub makes a statement, in my opinion, and will become an icon in Newcastle.” From eyesore to icon? Only time will tell. 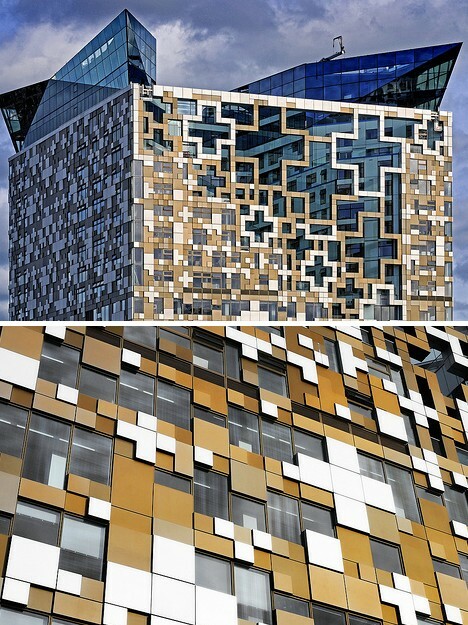 The 23-story tall The Cube office development in Birmingham has taken a lot of flak for its unconventional 8-bit style facade that led one critic to call it a “pixellated leviathan”. 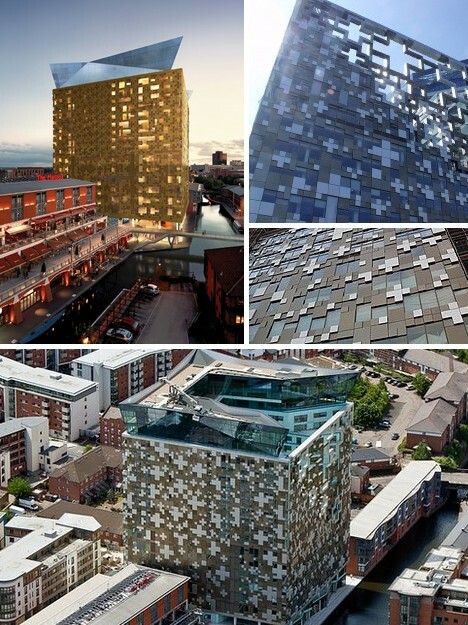 Designed by Make Architects with an eye towards Birmingham’s surrounding Jewelry Quarter, The Cube was was nominated for the 2010 Carbuncle Cup along with a jaundiced opinion stating it best resembled “a lumpy beige ornament your father buys your mother for her birthday because he thinks it’s classy, whereas she can see it for the tat it is”. Ouch. 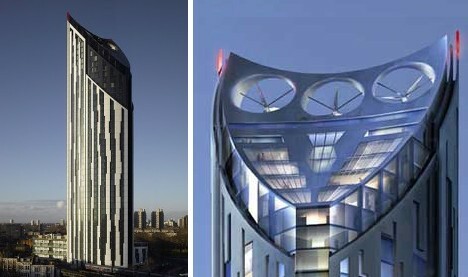 The Strata Building in central London’s Elephant & castle district was nominated by The Georgian Group for its “plain visual grotesqueness” and “breakfast-extracting” ugliness. 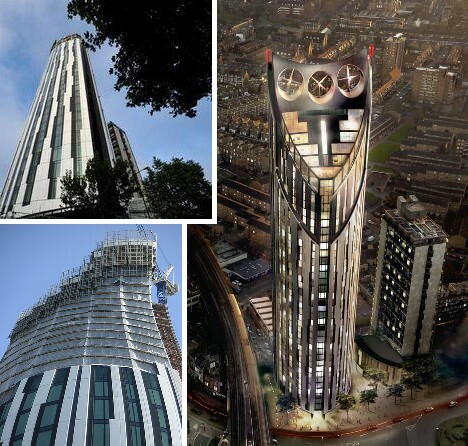 From its barcode- like cladding to the concave front facade to the electric shaver cut of its upper levels, the 43-story Strata Building (designed by BFLS) certainly stands out – then again, the 480 feet tall block is Britain’s tallest residential building and it dwarfs anything in the neighborhood. 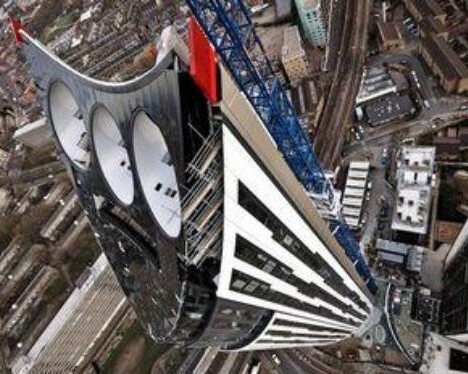 On the bright side, BFLS claims the three large rooftop wind turbines can supply 8 percent of the building’s energy requirements… one assumes, when the wind is blowing in just the right direction. 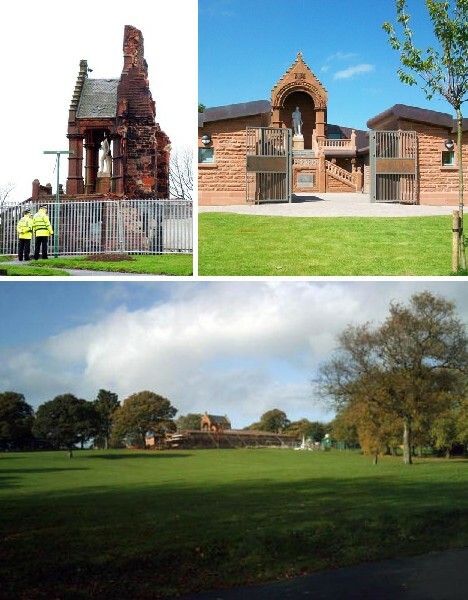 The winner of the 2010 Carbuncle Cup was selected in August by a jury comprising of Jonathan Glancey, Owen Hatherley, Amanda Baillieu and Ellis Woodman. Besides being well-versed in architectural knowledge and history, the jury members are also well-versed in, well, verse: they’ve displayed admirable proficiency in the traditional English art of snooty, disdainful dismissal. We’d very much like to see where THEY live and work.